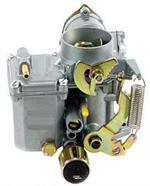 New 30 PCT Round Bowl Carburetor is the choice of 1600cc off road racers. Great bottom end, easy adjustments. Fits all Early VW's with S/P motors. Can be adapted to D/P motors with Carb. Adapt. Great on all stock Engines.